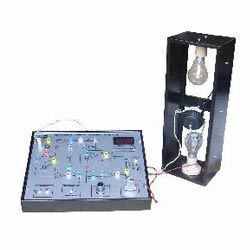 We are a distinguished manufacturer & supplier of Instrumentation Trainer Kits. These products are manufactured using premium quality raw material, which is sourced from reliable vendors. Our products are known for their attributes like low maintenance, user-friendliness, longer service life and accurate results. These products are demanded in varied branches of engineering namely mechanical, instrumentation, electronics, electrical and civil. 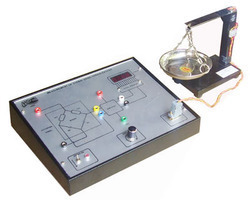 We manufacture the best quality of Strain Measurement System. Used for studying the working of strain gauge, the offered strain measurement systems are known for their high performance and precise measurement. The optimum quality of strain measurement system is never compromised and it is maintained as per the industry laid norms. Parameter Measured: strain in terms of kilograms on a cantilever beam. Measurement system: a] weights b] transducer with electronic instrumentation. Transducer: temperature compensated strain gauge. Type: Cu-Ni foil with polyamide carrier base. Gauge resistance: 350 ohms (nominal). Gauge base: 12.5 mm x 4.3 mm. Transducer: strain gauges mounted on a stainless steel measurement cantilever beam. Configuration: bridge with two arms as strain gauges (wheatstones bridge principle). Range: 0 - 5 kilograms. Actual strain: by various weights to be placed in a pan fixed with the beam. excitation source: DC regulated source. Tare adjustment: zero adjustment by a ten turn potentiometer. Readout: 3.5 digit digital display to indicate strain in kilograms. Test points: multicoloured test points are provided at various stages in the circuit to observe waveforms and voltages. Power requirements: 230v, ± 10% ac, 50hz, 1f. Panel size: 10" x 13". Standard accessories: detailed instruction manual. We are instrumental in offering the optimum quality of Pressure Measurement System. For the purpose of measuring pressure of various industrial processes, the offered pressure measurement system is used. Its precise measurement and easy operation, make this pressure measurement system highly demanded. The trainer is enclosed in an elegant powder coated metal cabinet with intelligently designed layout on acrylic front panel. 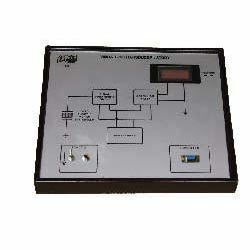 Measurement system: transducer with electronic instrumentation. Transducer used: general purpose pressure transducer with shielded cable and connector. Excitation source: 5v dc (regulated). Termission of transducer 1/2" D.S.P. Amplifier: solid state precision amplifier. Readout: 3.5 digit digital display. Controls: multiturn potentiometer for zero adjustment. Test points: multicoloured test points are provided at various stages in the circuit to observe the waveforms and voltages. Connector: facility for connecting transducer. Power requirements: 230v, ± 10% ac 50hz, 1 phase. Standard accessories: detailed instruction manual it consists of a foot pump to develop pressure and a chamber with provision to connect the pressure pump and release valve to release the pressure built up in the chamber. Foot pump of capacity (max): 10 kg. ADTRON’s model 3061, Measurement of Flow using Rotameter, Orifice & Venturiemeter system demonstrates the principle and working of a rotameter. The system consists of a sump tank, water pump, rotameter, ball waves and necessary piping all mounted on a suitable stand. The whole unit is a table – top unit. Sump Tank : Capacity : 20 Liters. Material : MS / Plastic. Water Circulation Pump : 20 LPM. Hand Valve : Type – Ball – 02 Nos. Rotameter : 35 LPM as reference. Water Manometer : U tube type. Adtron’s displacement measurement system demonstrates the principle and working of the specialised dedicated transducer known as ‘Resistive Motion Transducer’ and also shown is one of its unique application to measure linear physical displacement. A special micrometer screw type arrangement to vary the displacement accurately. A variable excitation source, electronic instrumentation and digital readout all enclosed in a specially designed users friendly elegant powder coated metal cabinet with intelligently designed layout on imported acrylic front panel, are some of its other important features. Parameter Measured : Linear Physical Displacement. Measurement System : a. Micrometer screw type arrangement. b. Transducer with electronic instrumentation. Type : Linear Motion Type. Actual Displacement : By micrometer screw type arrangement. Excitation Source : D. C.
Readout : 3.5 digit digital display to indicate displacement. Operating Voltage : 230V, ± 10% AC 1phase. Test Points : Multi – coloured test points are provided at various stages in the circuit to observe the waveforms and voltages. Adtron’s temperature controller and indicator using rtd probe is a versatile self contained stand alone unit, useful in the study and demonstration of the principle and working of a temperature indicator and controller using rtd probe. An electronic closed loop temperature measuring and controlling system with variable set point,special heating unit and digital readout are provided. The trainer is enclosed in a specially designed users friendly elegant powder coated metal cabinet with intelligently designed layout on imported acrylic panel, are some of its other features. Type: pt-100, immersion type probe in sheath with flange and flying leads. Sensor calibration: standard pt-100 to din 43760. Sensor accuracy: class b type. Configuration: bridge with one arm as rtd probe (wheat-Stone's bridge principle). Sensor range: 0 to 2000c. 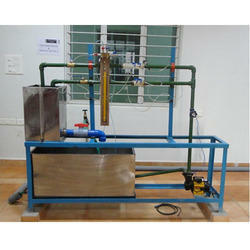 Actual heating process: heating unit of 200w capacity. Set point: adjustable over full range . Power requirements : 230v, ± 10% ac, 50hz, 1 phase. It has a built in mechanical filter for elimination of all unwanted frequencies including audio pickups. Displacement measurement: 1-1999 microns pick–up in one swing. Display: 3½ digit digital display ( lcd ). Frequency response: 600 rpm to 60,000 rpm. Looking for Instrumentation PART - 2 ?